RITES crosses a record Rs. 1500 Crore Turnover for the first time in History. Indian Railways on Tuesday signed an initial pact with rolling stock manufacturer SAIL-RITES Bengal Wagon Industry Ltd (SRBWI) for procurement of high-class stainless steel freight wagons at a cost of Rs 2,500 crore over 10 years. The joint venture between steel manufacturer SAIL and rail ministry’s arm RITES was set up in 2011. The company operates a wagon factory at Kulti in West Bengal, from where the wagons will be supplied. “The pact includes a commitment for procuring 1,200 new and 300 refurbished wagons every year over a period of 10 years,” Railway Board’s Member-Mechanical Hemant Kumar said. He added the factory at Kulti had been set up at a cost of Rs 120 crore and would be developed as a centre of excellence. The assured offtake pact with the railways also envisages procurement and installation of equipment at the factory by RITES. Steel secretary Aruna Sundarajan, who was also present on the occasion, said the steel ministry was working on an ambitious plan to ramp up domestic steel-making capacity from 100 million tonnes (mt) to 300 mt over the next few years. The increased steel supply would cater to the railways’ massive modernisation and expansion plan, she said. Railway Board Chairman A K Mital said the assured supply of wagons over 10 years would help Indian Railways improve freight loading from 1.1 billion tonnes (bt) currently to 1.5 bt over the next five years. “This JV will give new wagons of increased capacity and better technology. Also, this factory will come up in an area (East) that contributes to a bulk of the loading,” he said. The Memorandum of Understanding (MoU) signing ceremony was attended by rail minister Suresh Prabhu, Steel and mines minister Narendra Singh Tomar, SAIL Chairman A K Pujari and RITES Chairman Rajeev Mehrotra. Indian Railways have taken another step in line with “Make in India” initiative of Govt. of India by signing the Assured Off Take Agreements (AOT) with SAIL-RITES Bengal Wagon Industry Pvt. Ltd. (SRBWIPL) for manufacture & rehabilitation of wagons at Kulti, West Bengal. The Minister of Railways, Shri Suresh Prabhakar Prabhu was the Chief Guest at the Agreements Signing Ceremony here today. The signing has paved the way of commencement of the production of stainless steel wagons at the factory. The Union Minister of Steel and Mines, Shri Narendra Singh Tomar was also specially present on the occasion. Chairman, Railway Board, Shri A.K. Mital, Secretary, Ministry of Steel Ms. Aruna Sundarajan, Railway Board Members, CMD SAIL, CMD RITES and other senior officials were also present on the occasion. Speaking on the occasion, Minister of Railways Shri Suresh Prabhu said that today’s Agreement is a very significant landmark for both Ministry of Railways and Ministry of Steel. Two major PSUs of Central Govt. namely RITES of Ministry of Railways and SAIL of Ministry of Steel have come together to set up a joint venture which is a Rs. 2500 Crores “Make in India” initiative. He hoped that the factory will manufacture most modern wagons which are required for expansion of Indian Railways and the factory will emerge as a Centre of Excellence for development and manufacture of special purpose wagons for domestic and international market. Shri Prabhu said that it will contribute to the economic development of the region and lead to employment generation and creation of ancillary industries. Shri Suresh Prabhu pointed out that the steel is a very important component for the development of economy. He said that the increased consumption of steel spurs demand for iron ore which in turn helps Railways as it gets more freight to transport. He said that Indian Railway should also consider other options like using aluminium for manufacturing wagons. In his speech, Union Minister of Steel & Mines Shri Narender Singh Tomar said that RAIL and SAIL are both very important pillars of country’s economy. The partnership between the two will be very useful for the nation and it will benefit both SAIL and RAIL. Referring to the unfavourable conditions prevailing for the steel industry, Shri Tomar said that we are all working with our full capacity and hope to overcome these difficult times. Shri Tomar said that Rail Connectivity is very important for the development of the industry. He said that under the guidance of hon’ble Prime Minister Shri Narender Modi and the Railway Minister Shri Suresh Prabhu, Indian Railways is taking giant strider for expansion and modernization. He said that many new facilities and initiatives have already been created by Indian Railways recently for the benefit of the rail users. Shri Tomar assured that Ministry of Steel is always there to stand behind Ministry of Railways to work shoulder to shoulder for the betterment of the country’s economy. This factory is ready and the production will commence very soon. This project was announced in 2010-11 and subsequently a Joint Venture (50%:50%) was set up between two major PSUs namely, SAIL (PSU under Ministry of Steel) and RITES (PSU under Ministry of Railways). The land for the factory, which is ready for production, has been provided by SAIL and has been constructed at an approximate cost of Rs.120 crore. This project combines manufacturing and infrastructure expertise of SAIL and RITES with Indian Railway’s commitment and support of Make in India initiative. This is a long term Assured Off Take Agreement for manufacturing of 1200 wagons per annum and rehabilitation of 300 wagons per annum for a period of 10 years. The total cost of the Assured Off Take will be about Rs.2500 crore. This factory is likely to generate employment for about 400-500 people and will provide skill development opportunities for local people. Secondary and tertiary opportunities also become available which will lead to economic growth and all round development of the area. This factory is equipped with high end state of the art machinery and plant to achieve quality as well as productivity and it is expected that it will emerge as a centre of excellence in wagon manufacturing with high capacity new design wagons. Ø Total covered space – 10,800 sq. mtr. Approx. Ø High end sophisticated hydraulically controlled jigs & fixtures for manufacture of underframe, side body & end body of wagons. Ø SRBWIPL has been awarded ISO: 9001-2008 certification for its Quality Management System. Ø ISO 14001 for Environment Management System is expected by Jan’2016. On November 7, the Rail India Technical and Economic Service (RITES) submitted their final Detailed Project Report (DPR) to Alok Ranjan – the Chief Secretary of the Government of Uttar Pradesh in the presence of heads of various government departments. This list of heads includes Kumar Keshav who’s the Managing Director of the Lucknow Metro Rail Corp (LMRC) which will be executing the Kanpur Metro project. To sidetrack for a second, Kumar Keshav was earlier the Director of Project and Planning at the Delhi Metro Rail Corporation and was instrumental in the design of many metro routes in Delhi, so the Lucknow Metro and Kanpur Metros are in good hands! Similarly, the LMRC is also responsible for coordinating the preparation of the DPRs for metro projects in Meerut, Agra (see details) & Varanasi, and will most likely execute/manage their approvals, construction and launch activities. As a reminder, geotechnical investigation for Kanpur’s Metro has been carried out at multiple locations. Work to prepare the project’s DPR began in March 2015 and a preliminary DPR was submitted in August to the Kanpur Development Authority. Line 1 is pegged to cost Rs 9,500 crores and a portion of it will be built underground in the core of the city. The elevated stretch will be 15.164 km long while the underground stretch will be 8.621 km long. 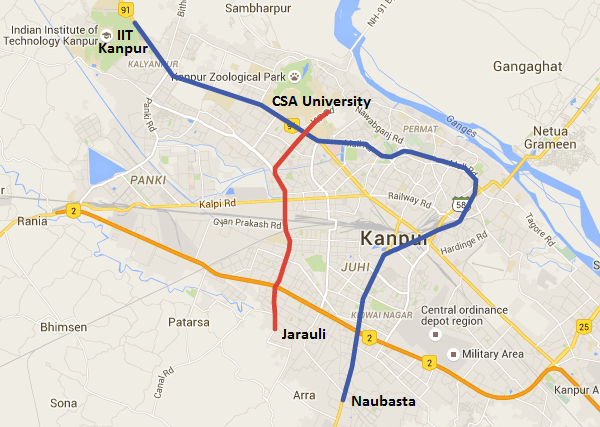 The proposed route would begin from IIT and would pass through Kalyanpur, Rawatpur, Mall Road, Phoolbagh, Kanpur Central Station, Jhakarkati Bus Terminal, Transport Nagar, Bara Devi, Kidwai Nagar to reach Naubasta. This line will have 28 trains each consisting of 4 coaches. Line 2 will run from Chandra Shekher Azad University and pass through the vicinity of GSVM Medical College, Fazalganj, Vijay Nagar, Govind Nagar, Barra to reach Jaurali. This line will have 9 trains each consisting of 4 coaches. As per the DPR, the trains will be run on standard gauge track (1435 mm) and will have a Peak Hour Peak Direction Traffic (PHPDT) of 16,800 passengers by 2021 for line 1 from IIT Kanpur to Naubasta. After the UP government approves the project, the tendering process to select civil construction contractors and a General Consultant will begin! Railways will be setting up first-of-its-kind plants at New Delhi and Jaipur stations for disposal of solid waste in environmental-friendly manner and generation of energy from the garbage. The plants are proposed to be set up under the Waste-to-Energy project of the Railways, a ministry official said. “There will be two plants, first-of-its-kind in railways, for disposal of municipal solid waste (MSW) generated at stations as well as conversion of MSW into electricity and synthetic gas,” the official said. The proposed capacity for handling waste is 20 tons per day at New Delhi station and 5 tons per day at Jaipur station area. Railways will provide 1000 sq metre land on licence fee basis in the vicinity for setting up the plant. RITES, a railways subsidiary, has invited Expression of Interest (EoI) for the project. “Organisations having the expertise and experience in the field are invited to express their interest in the project. Plants would be run on build, operate and maintain basis for a period of at least 10 years,” the official said. At pressent solid waste generated at stations are transferred to nearest designated location of municipality and in this process a considerable efforts and physical transportation are required. However, the dealy in transfer also causes early degradation leading to unhygienic circumstances within the railway premises. Train journeys are going to be filled with pleasant surprises. As part of the Indian Railways’ new promotional policy, passengers will be offered free goodies and discount vouchers during their journey. And no, the cash-strapped Railways won’t have to pay the bill for the freebies; in fact, it will help them earn a revenue of several crores of rupees without spending a paisa. Railways Minister Suresh Prabhu, a chartered accountant, hit upon the idea to help the country’s largest public transporter improve its fiscal health while improving the traveller’s train experience. Passengers travelling by Kalka Shatabdi and New Delhi-Amritsar Shatabdi under the Northern Railway division have been the luckiest as products like Sensodyne toothpaste and Titan discount vouchers are being given to them for the last one month. “I loved it. This approach from advertisers is new and interesting. The size of products may not be big, but it was a pleasant surprise gift,” says Amarjeet Singh, who was traveling from Amritsar to Delhi on the Shatabdi this week. The move comes after a study by RITES, a Mini Ratna Central Public Service Enterprise under the Ministry of Railways, found that the Railways has a potential to earn Rs 10,000 crore a year just by selling advertising space in coaches, wagons and stations. The outreach of such a campaign is huge as the Railways operates 13,000 trains on 63,000 km of track every day, ferrying 23 million passengers, equivalent to the population of Australia. This is how it works. The catering licensees of around 8,000 premium trains like Rajdhani, Shatabdi, Duronto, mail and express trains have been authorised for advertising rights and promotional advertising campaigns in their contracts. The Railways has streamlined the system and the license fee charged per year includes revenue for such rights. The licensee has to pay a fee every year while the catering contract is for five years. As per the new standard bid document, caterers are expected to pay the Railways a fixed amount per year per train at the time of bidding for licensing under promotional advertising campaigns. The amount varies from train to train ranging from Rs 4 lakh to Rs 10 lakh per year per train. So, the Railways’ earnings would be somewhere between Rs 400 crore to Rs 800 crore annually. “Licensees may be permitted to undertake promotional advertising campaigns for the benefit of travelling passengers subject to authorisation from the Railways before the commencement of each campaign,” said a senior Railways officer. Caterers can tie up with companies for distributing samples of their products for free to passengers. But the Railways has put a clause that caterers must seek permission about the products to be distributed, and prohibited items like tobacco, cigarettes or alcohol are not allowed. Also, no audio, video material, stickers or anything that may damage to the Railways property shall not be permitted. Advertisers who are always looking for new ways to attract eyeballs are finding trains a good proposition to woo the middle class and upwardly mobile. Firms have found innovative ways to engage passengers like a Test Your Oral Health pamphlet in which travellers are asked three questions on oral hygiene and are asked to rate themselves on a scale of 1 to 5. The move is a win-win for companies and the Railway. While there is zero cost to the Railways as train attendants distribute products, firms will get a huge audience. The Indian Railways is banking on extra budgetary support of Rs 8.5 lakh crore during 2015-18 to complete its pending projects. The Life Insurance Corporation of India (LIC) has already pledged Rs 1.5 lakh crore in the next five years to the Railways.